Unhealthy lifestyle and genetic inheritance sometimes results in people having elevated blood pressure level. High blood pressure, otherwise known as Hypertension, can lead to heart attack, Stroke, Heart disease, and numerous health problems. Hence the need and urgency to do everything possible to control and reduce it. 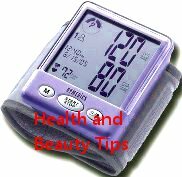 People with high blood pressure have to go on medication to lower and regulate their blood pressure level. A healthy life style and maintaining a balanced diet has scientifically proven to control the blood pressure at a manageable level and help in enhancing the quality of life. Low-Fat and Non-Fat milk, Yogurt, and Cheese—Food that contains Calcium has been proven to help regulate blood pressure, and study says most people who don’t get enough calcium in their diet are prone to having elevated Blood pressure level. Americans in particular have this as their calcium intake are small. It’s important that these diary products are low- or non-fat. However, as a high fat intake contributes to high blood pressure since Dairy foods are often fatty, so be sure to read the labels the next time you are at the grocery store to buy these items ! Intake of lots of fruits and vegetables, especially citrus fruits, bananas, melon, spinach, strawberries, and tomatoes helps in controlling your Blood Pressure. What you really want from your fruits and vegetables is to have rich in potassium. Potassium is essential and helps in lowering blood pressure, and can be found in high quantities in fruits and vegetables. Whole grain rice, bread, pasta, and oatmeal are a good source of carbohydrates like starch and fiber. The general misconception among people is that, foods rich in starch like breads, rice and pasta are fattening but the fact is they are not. However, addition of fat rich substance like cheese, mayonnaise, oil results in people end up consuming fat rich food. Nuts and seeds that are rich in magnesium—Like potassium and calcium helps a lot in controlling the Blood pressure. A diet rich in magnesium is one of the best ways to lower blood pressure. Make it a habit to put in few nuts in your mouth when you come across almonds, cashews or Pine nuts. Look for almonds, soybeans, kidney beans, and lentils as rich sources of magnesium in your daily diet. Animal proteins like fresh fish and seafood are high in omega 3 oils, monounsaturated fats and calcium; all of these are helpful in reducing the risk of heart attack and managing high blood pressure problems. Ensure you are maintaining an active life. Pursue your hobbies, take up any sports of your liking, march on a artistic pursuit, think positive and make an effort to do something new that enhances your thinking. Life is full of opportunities and make the best use of them. A balanced food habit supplemented with a disciplined life style is the way to a healthy and prolong life. You have one life, so live it to the fullest.